Why choose a trust ? The right wealth structure for you will depend on your particular needs and circumstances. The following arrangements may provide some protection to a certain degree (but with many disadvantages and uncertainty for the future of your Estate). Joint accounts offer no guarantee that the other party will respect your wishes with regards to the management or distribution of your Estate. Upon death, it is possible that the funds will be subject to various taxes. Power of attorneys in most jurisdictions are of limited use in Estate planning, as they often become automatically ineffective on death. Safe deposit boxes allowing a named party to have access after your lifetime present certain risks. They offer limited protection and pose significant risks due to the often complete and unrestricted access the named party would have to the assets. Making life easier for you ! A properly managed structure should help in making life easier for you by providing a tailor-made clear management and reporting approach. In simple terms, as trustees of a trust fund, we have a fiduciary duty to manage and take care of the assets with which we have been entrusted. Our disciplined approach to holding, managing and reporting, gives significant comfort to clients. This also significantly reduces the burden which often otherwise falls upon the client, and frees up the client to spend their time on other matters. What is a trust ? A trust is a legally binding arrangement whereby a person (the Settlor) transfers assets to another person (the Trustee) who is required to administer the trust assets in the best interest of the beneficiaries in accordance with the Trust Instrument or Trust Deed. The Settlor may be a beneficiary. 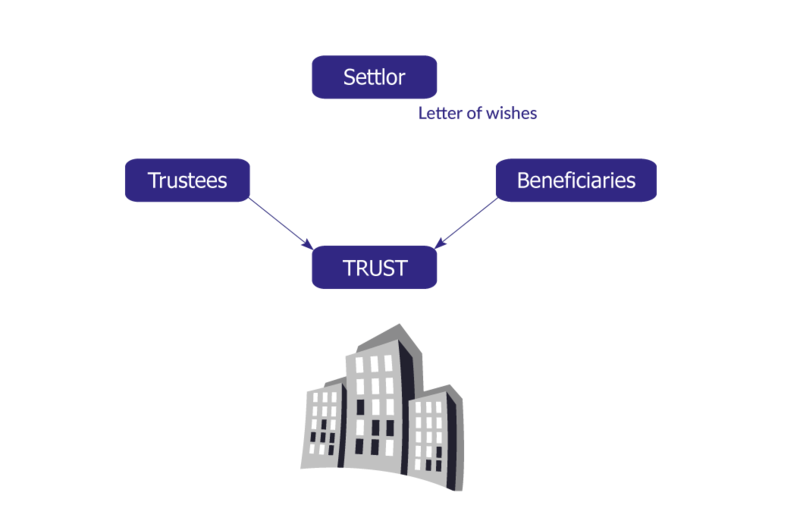 For a Discretionary Trust, a Letter of wishes is often used, which is an informal letter from the Settlor which sets out the manner in which the Settlor would like to see the Trust assets distributed or the Trustee’s powers exercised. This is not a legally binding document and the Trustee may have regard to the letter provided that it does not conflict with the terms of the Trust instrument. The letter may be amended by the Settlor at any time. It is also possible to have the Trust Deed set out the manner in which the Trust Fund should be held or invested, and how it should be distributed. Trusts were created about 500 years ago at the time of the Crusades. When a wealthy land owner joined the Crusades, he sometimes placed his land, property and money in the hands of a trustworthy individual for safekeeping with an obligation to care for the wealthy individual’s family until his return. As the United Kingdom legal system was then based on Civil Law, this created many issues especially upon the death or return of the land owner. As the system was reviewed and changed to Common Law(*), this allowed for Trusts to be created. (*)Different Legal Systems: Common / Civil / Shariah Although the Trust concept has its origins in Common Law, other legal systems also embrace the concept. The widespread international adoption of the Hague Convention on the Law Applicable to Trusts and on their Recognition, is a further measure of the crossover of the Trust concept into Civil jurisdictions. The "Sharia Trust", is another increasingly common application of Sharia-compliant trust structures, which again demonstrate the worldwide application of the Trust concept. The Foundation is an ancient institution in civil law countries. Its application in the arena of international estate planning for families has been relatively limited. In particular, the Liechtenstein Family Foundation is one of the principal vehicles which has proved of durable use for international families. A Liechtenstein Family Foundation (or “Stiftung”) is a legal entity established in Liechtenstein for the purposes of managing private assets for the benefit of a set of beneficiaries. A Foundation has been described as a hybrid entity with many similarities with both a typical company and a typical trust. In many respects this is true as like a company, the Foundation is a separate legal entity with Articles and a Board. However, with the concept of the Regulations which may outline specific beneficiary appointments and distributions and the provision for the appointment of a Protector, one can well see the similarities to the common law trust. The use of the common law trust has gained widespread international acceptance among professional investment and banking communities. It is thus widely accepted and indeed legislated for in numerous jurisdictions. The Liechtenstein Foundation, has on the other hand been used on a much less widespread basis, and has therefore received less international acceptance. Clearly this has meant that there is a lack of familiarity amongst many international professionals about the benefits of the Liechtenstein Family Foundations which continue to be a very useful and effective Estate Planning tool. For families and their advisers who wish to explore the use of a Family Foundation, or indeed the use of Family Foundation in addition to a trust vehicle (which is not uncommon), we would be happy to discuss the options available. Because we know that your case is unique, we can provide you with tailored solution. Copyright (C) 2016 salamanderinternational.com All rights reserved. Salamander Group is a member of ARIF, a self-regulating body approved by the Swiss Financial Market Supervisory Authority (FINMA) for the supervision of the financial intermediaries referred to in article 2 para. 3 of the Swiss Federal Law on combating money laundering and terrorism financing in the financial sector (AMLA). ARIF is also recognized by FINMA as a professional organization for laying down rules of conduct relating to the practice of the profession of independent asset manager within the meaning of the Swiss Federal Act on collective investment schemes.